Oregon happens to be among the richest sources of truffles on the planet. You probably didn’t know that; almost no one does. The harvest is, nevertheless, measured in tons and provides a livelihood for many Oregonians. Truffles are also among those rare foods that can cast a golden glow over whole regions, helping to promote tourism, adding value to a huge array of food products, and generally adding a layer of exceptionality to everything a truffle region has to offer. I hate to invoke Napa, but that brand is the classic example. 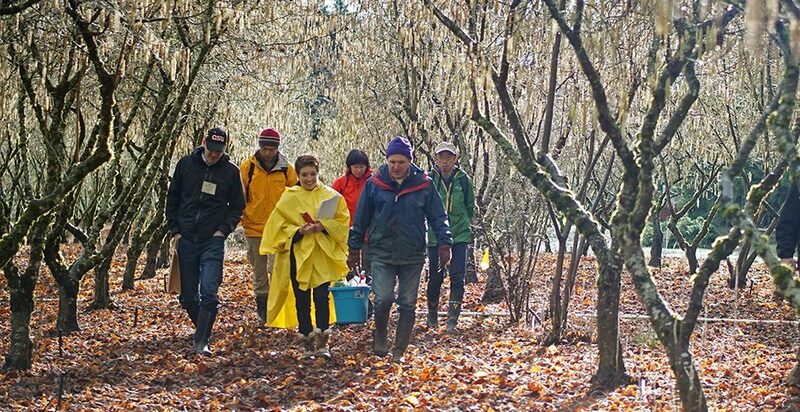 Truffles can do something similar for Oregon, amplifying their economic and cultural impact far beyond the direct benefit to a few harvesters and farmers. While I was in graduate school I started a business called New World Truffieres, which grows oak and hazelnut seedlings inoculated with the famous truffles of Europe. Now, years later, my customers are successfully growing the French black perigord and two other European truffle species in orchards on their farms. A number of them are about to cross the threshold into profitability this winter. Perigord truffles have been bulging out of the ground since mid-September in advance of the winter harvest season, and they will appear on a few local menus shortly after this article is published. This combination of remarkable native truffles and cultivated European species makes our Willamette Valley truffle region uniquely the place in the world that has it all. We foresaw this moment some time ago. Leslie Scott, former general manager of the Oregon Country Fair, and I started the Oregon Truffle Festival in 2006 with the explicit intention of elevating the status of our native truffles. We knew that Oregon had world-class culinary truffles that would hold their own as cultivated European truffles hit the scene, provided we could turn their reputation around. The problem was a lack of quality control, but the solution was simple: we needed to train dogs. The function of a trained truffle dog isn’t just to find truffles; dogs also know which ones are ripening. In that sense, truffle dogs do the most essential part of quality control by leaving immature truffles to ripen in the ground. There were no working truffle dogs in the Western United States in 2006, so our challenge was to promote the use of trained truffle dogs, and to recruit professional trainers who were willing to take on this new specialization. We also needed to promote the truffles themselves, of course, but that part was easy. We threw a party. It worked. Since 2006, the price of native Oregon white and Oregon black truffles that are harvested with dogs has increased by a factor of 10 over the old harvest method that I’m not even going to mention. I’ve already heard the howls of protest: We’ve driven the price of truffles so high that Oregonians can’t afford them anymore. I have two responses to that: First, just train your own dog. It’s doable, and the truffles are absolutely everywhere around you. When I trained my dog, I found that there were truffles beneath the trees in my neighbor’s yard. Second, you have a lot more to gain from them now, and—used properly—a small winter white truffle can infuse a dozen eggs, and a pound of butter, and you can still shave it over your food at a dinner party! And honestly, who wants a cheap substitute for the real thing anyway when you have the real thing right under your dog’s nose? We just need to handle them and celebrate them like the delicacies that they are. Now I know that some of you are wondering when I’m going to get to the part where I tell you where to go find truffles. Well, it’s complicated. I could, of course, direct you to a lot of places where you would definitely find lots of truffles. The trouble is that there are no places where it is legal for you to harvest them without a permit, and there is (with one exception) no public land management agency that will issue one to you. The exception is the Salem District of the BLM. Now that there are truffle dogs, one district of one agency has seized the opportunity to offer harvest permits to the public, but the dog is required, and the permit isn’t cheap. Otherwise, all of the truffles are on private land, and the State Department of Forestry requires all truffle harvesters, as well as harvesters of any other forest product, to have a permit issued by the land owner. Therefore, the place to begin your search is to find friendly people with land who are willing to sign the permit for you. One caveat here: that land has to have a stand of Douglas-fir trees on it. Turns out, that’s not hard to do. Douglas-fir is the dominant tree throughout Western Oregon. It’s everywhere you look. That’s it; once you have a trained dog, you’ve got a permit, and you’ve found Douglas-fir, you will start finding truffles. (See the sidebar for the different species and their harvest seasons.) They aren’t very abundant in most places, but you can find them in ones and twos in nearly any Douglas-fir forest. Then, at some point, you’ll stumble into a “patch,” and you won’t be able to keep up with your dog. In the first year of OTF’s North American Truffle Dog Championship, the Joriad™, the winning team found a truffle growing wild in the forest every one minute and thirty five seconds for a full hour. That’s about as fast as humanly possible considering that you’re digging them up, and then dashing after the dog for the next one. Finally, you can grow your own. New World Truffieres and the Oregon Truffle Festival, both local Eugene businesses, are here to help you do it. Truffles are a crop that is farmed all over the planet. The prices are high because demand is high, which makes them easy to sell. It is a new form of sustainable agriculture, and though growers starting now face uncertainties that may not be solved for years, the same was true of Oregon’s wine industry 30 years ago, and look at it now! That is where Oregon’s truffle industry is heading. A primary purpose of launching the Oregon Truffle Festival was to lay the foundation for a local industry that offers economic and cultural benefits to a broad spectrum of Oregonians. It’s an industry that nearly anyone who has a dog, or makes cheese or charcuterie, or runs a restaurant celebrating local and seasonal specialties, or who just loves to eat can participate in. Dog-harvested truffles, from their hidden source in the forest to their glory on the table, add value to everything they touch. We welcome you to join us in January for the ultimate bliss-food experience. Dr. Charles Lefevre, a forest mycologist and founder of the Oregon Truffle Festival. Oregon winter white truffle (Tuber oregonense): Piercing aromas of solvent, butter, and fresh-roasted hazelnut with a billowing of mint when they are first unearthed. Found mid-December through early April. Oregon black truffle (Leucangium carthusianum): The aroma of young, fresh Oregon black truffles is a beguiling mélange of fruit, from pineapple to strawberry, blending as they age into chocolate, Parmesan cheese, and freshly-fallen leaves. Found October through May, with small quantities available year-round. Oregon spring white truffle (Tuber gibbosum): This powerful but little-known truffle is the one you’re most likely to find in town. Its aroma is similar to the winter whites, but with less solvent, and an extra something reminiscent of seafood. Found May through July. Oregon brown truffle (Kalapuya brunnea): This mysterious truffle was just given its name in 2010, and though widespread in the Douglas-fir forests of Western Oregon, it is always found unexpectedly. Its aroma is unmistakably reminiscent of cooked cauliflower, but with a little extra something that leaves some people enslaved by their love for it. Found late summer through autumn. Annual truffle commerce is expected to exceed $6 billion within the next two decades. Retail prices in the U.S. for the French black truffle, or perigord truffle, and the Italian white truffle have reached $1,000 and $3,000 per pound. Truffles are underground versions of mushrooms. They don’t form a prominent stem, and their spore-bearing surfaces are enclosed. They rely on animals eating them to distribute their spores instead of air currents like mushrooms. In order to be located by hungry critters, truffles have evolved strong scents that, as they mature, can be detected from a distance by a suitably sensitive nose. In a 2005 auction in Italy, a 2.4-pound truffle (one of the biggest ever found) sold for $52,000. Oregon truffle prices vary, but can range from $50 to $500 per pound. Originally, female pigs were used to find truffles in Europe because the truffle’s odor resembles that of a male pig’s pheromones. Truffle facts compiled from the North American Truffling Society.